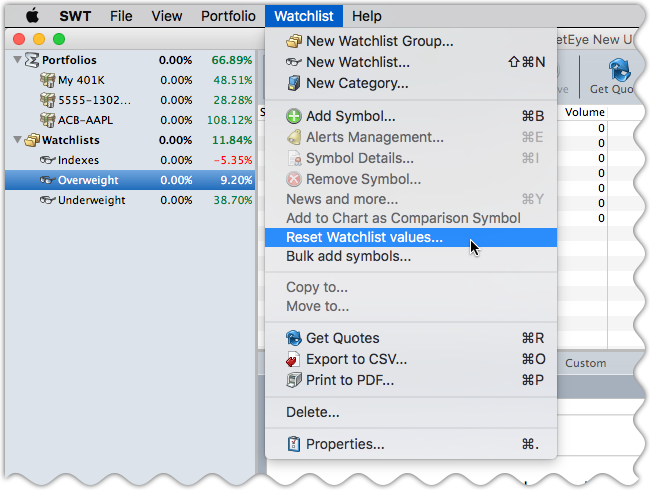 Items in a watchlist, in addition to the ticker symbol, have a date and starting “watch” price associated with them. Typically the date is the date you added the item to the Watchlist, but it can also be any arbitrary date that you choose. This can be useful, for example, for tracking performance of the items in the Watchlist since a specific date in the past. The starting “watch” price is, by default, the current price of the symbol when you add the item to the watchlist. However, you can set the “watch” price to whatever value you want. This can be useful, for example, for tracking the price changes in the ticker symbol since the price you sold it or the price it was on some date in the past. You can edit these values individually by selecting the item, then clicking on the “Details” button in the toolbar. StockMarketEye lets you update the date and “watch” price for all items, or even for a sub-selection of the items, in the list at once. If you want to update just some of the items in the list, select them. If you want to update all of the items in the list, remove any current selection. In the new window, choose the option for how you want to reset the values of the items in the Watchlist. Reset both the “Date Added” and “Watch Start” columns to historical values from a specific day in the past. StockMarketEye will find the historical value for each item in the watchlist on the selected day. It will then set the “Date Added” column for that item to the selected day and will set the “Watch Start” value for that item to the selected historical value from that day. Reset both the “Date Added” and “Watch Start” columns to the current date and most recent Last price. StockMarketEye will set the “Date Added” column for each item in the Watchlist to the current date and will set the “Watch Start” value for each item to the current Last column value. Reset just the “Watch Start” columns to the most recent Last price. Reset just the “Date Added” columns to today’s date. Click “OK” to reset and save the values.